It is the longest day of the year and early in the morning it is bright up here on the Baltic sea. Bright and wet. 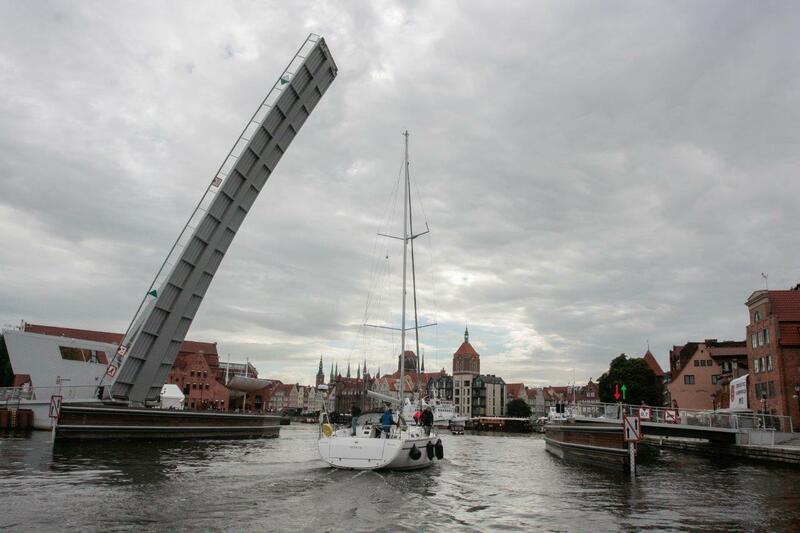 At three o’clock in the morning on 24 June 2018, the twenty-two boats of t he international SOUTH COAST BALTIC Boating Rally pass the city bridge and leave the port of Gdańsk. For the third time the international flotilla set sails in Gdańsk has a stop-over in Kaliningrad and ends up in Klaipėda. Some of the rally participants took the opportunity to explore the young and lively city Gdańsk some days before the start of the Rally. They knew about the exciting balancing act between past and future succeeds: On the one hand, the monuments such as the Marienkirche bear witness to the long German-Polish history, on the other hand the partially glazed cube of the brand-new museum of the Second World War shows the history in the present. The city is young and has changed in recent years from a grey port city to a colourful metropolis. Pubs, clubs and restaurants line up here, street musicians, festivals and markets characterize the picture. Right in the middle, opposite the world-famous Krantor, against a magnificent backdrop lies the marina Gdańsk and thus the perfect meeting point and starting point for the Boating Rally. In addition to sanitary facilities, washing machine, shopping facilities, fresh water and electricity on the jetty, the marina has free, password-protected Internet access. The old town is within walking distance. 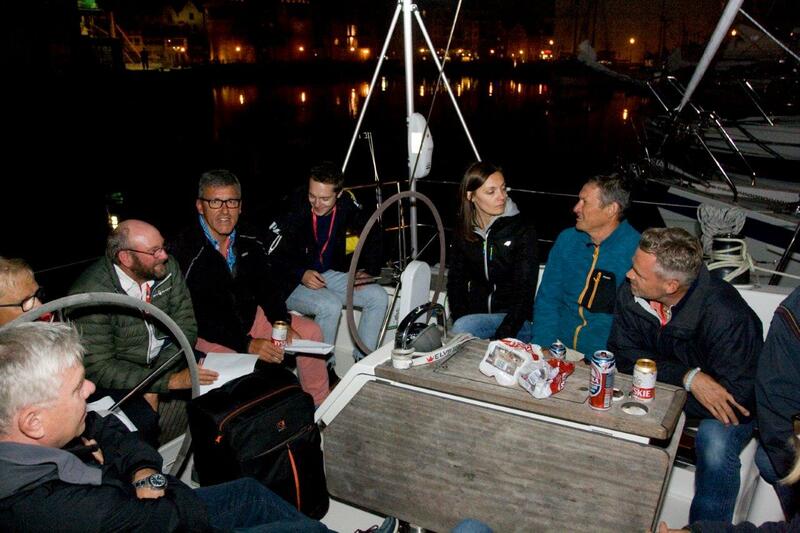 For the participants of the Boating Rally it is just as important to get to know the respective places on land as it is to experience the long distances and rather unknown areas together with other sailors. The distances from one place to the next are long and the formalities for entering Kaliningrad are avoided by many. In a boat community this is safe and pleasant. Three boats have already met at Bornholm, in the harbour of Svaneke. First they wanted to get to know Bornholm from the culinary side and then they wanted to sail together to Gdańsk for the rally start. But the Baltic Sea impressively shows what it can do with winds and waves. Each participant then chooses the best route for him and his boat. After about 3 nautical miles we pass the western plate and reach the open sea. The field is spreading quickly. Each of the participating boats has different requirements. Sometimes it is the length, sometimes the sails, but sometimes also the tactics of the skippers that give the boats advantages. Most reach Baltiysk (Pillau), the border station to clear in and out to Kaliningrad in the early afternoon. The Russian customs officers are in the mood for the World Cup. It takes less than 30 minutes to check crew lists, passports and visas or fan ID (for those who have a ticket for a World Cup match). Afterwards we go into the 20 nautical miles sea channel to Kaliningrad, which may only be navigated under engine until. After about 14 nautical miles, the marina Wsmorje appears with a total of 70 berths in one of the many canal bays. It is the first port that boaters could call at. Although it is not located directly in the city, but with a good infrastructure, it is ideally suited for exploring Kaliningrad from here. For the rally boats is however reserved in front of the World Ocean Museum. First, the two-storey train-car lift bridge must be passed. 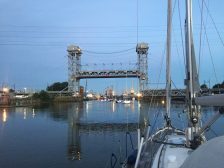 The opening is a rare exception and the clearance height is 17.90 meters, so yachts with higher masts have to stay in front of it. 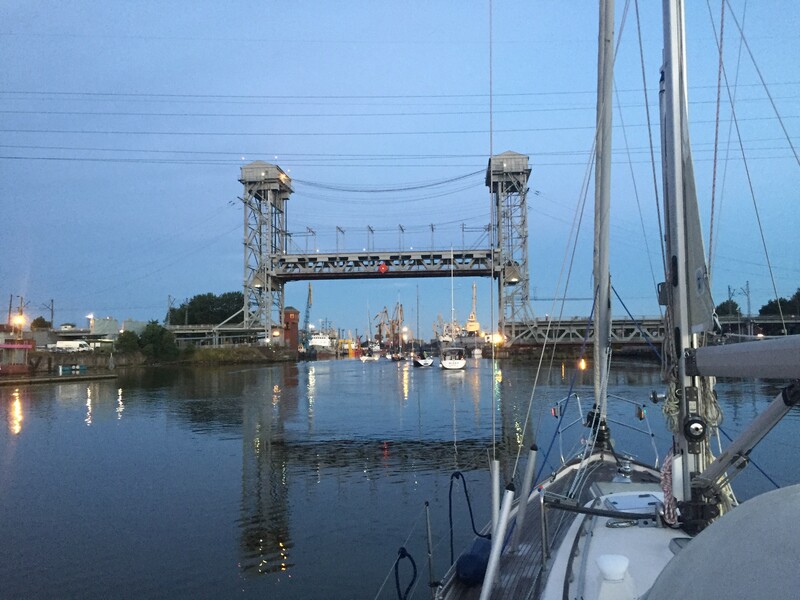 The Kaliningrad Marina, the so called Fishboat, offers mooring on request. Although it is not very comfortable, it is guarded, close to the centre and with an industrial harbour backdrop. The opening of the bridge is a sensation even for the cheering Kaliningraders. They stand at the Quai wall and welcome the flotilla participants with disco ship and running cameras. Much is different in Kaliningrad this year. The city is the venue of the World Cup. The city has dressed up and Russia presents itself from its very best side as a courteous and helpful host. Whether as spectators during the football match Spain against Morocco in the newly built Kaliningrad stadium or on the fan mile everyone is in celebratory mood and the boaters are enthusiastic. But it is also worth visiting Kaliningrad. Especially the Kaliningrad Cathedral, the Kant-grave and the reconstructed fishing village, just to mention a few highlights. The nearby amber coast with the bathing resorts Yantarny and Svetlogorsk (“City on a Light Mountain”) is also a local recreation area for Kaliningraders and popular with the Muscovites. The next morning at 3 o’clock the bridge rises, again spectators stand at the Pregelufer and say goodbye to the boats. After 20 nautical miles in the sea channel and a friendly and fast handling in Baltiysk, the flotilla takes course north, north-east to Klaipėda, 90 nautical miles away. But the forces of nature obviously have something against it. This time the wind comes from the same direction and the trip ends well after midnight at Smiltynė Yachtclub on the northern tip of the Curonian Spit in Lithuania directly opposite the city centre of Klaipėda. Before that, however, we had to check in and out on the Klaipeda side, something that has never happened before. The historic old town of Klaipėda, the water-covered headland of the Memel Delta in Ventės Ragas (Windenburger Eck), the old fishing village Dreverna, by ferry across the Curonian Lagoon to Juodkrantė, Nida and the magnificent dune landscape of the Curonian Spit made the participants enthusiastic. 98 kilometres long, the Curonian Spit peninsula on the northern coast of Samland is so unique that it was declared a UNESCO World Heritage Site in 2000. The largely untouched landscape is characterised by extensive bird sanctuaries, idyllic villages and, above all, huge shifting dunes that once even buried villages time and again. The next day, the exploration in the direction of Nida starts by boat on a wooden Kurenkahn, which was once a common fishing boat in the Curonian Lagoon. 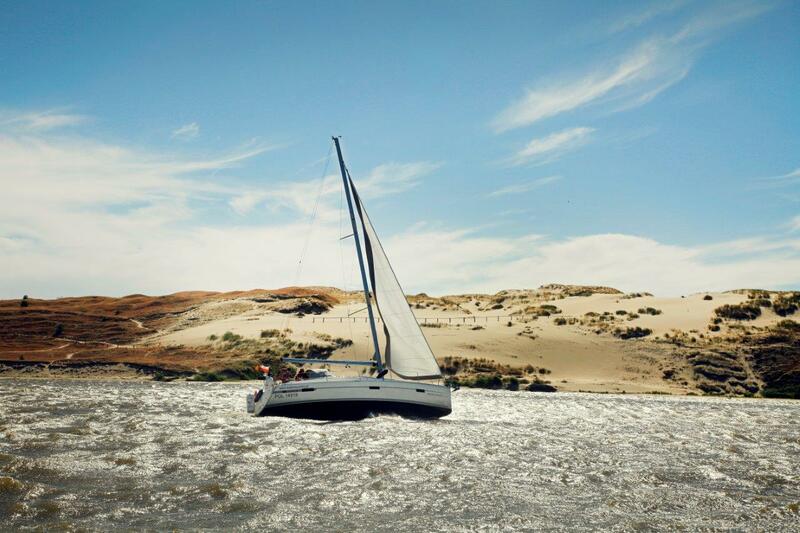 With aft wind, the barge roars along the coast of the lagoon even without sails. For the last stretch towards Nida it is advisable to stick to the barrel line. From Juodkrantė Karolis, the harbour master of Nida, who knows the partly shallow lagoon like the back of his hand for a maximum depth of up to 2.20 metres, also climbs up and guides four boats sovereignly through the water. In the tranquil seaside resort of Nida with its small old town and only four kilometers from the Russian border, the Boating Rally 2018 ends. 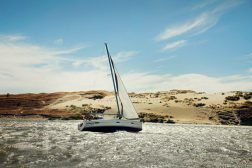 Within a few days, a sense of community has developed with people who share one passion: sailing. The SOUTH COAST BALTIC Boating Rally takes place in this form every two years. This third rally was financed by the marketing initiative SOUTH COAST BALTIC from the EU funds of the Interreg programme 2014-2010. The next rally is planned for 2020. For the year 2019 a rally in the regions Vorpommern – Bornholm- Zachodniopomorskie is planned from 10th to 18th August. The detailed programme will be presented at the booth of SOUTH COAST BALTIC at boot 2019 in Düsseldorf.